300.2 nautical miles travelled, 64 hours and 49 minutes sailed, 2 islands, 2 countries, 2 rivers and one anchorage. At the end of May 2016 there was a Starcross Yacht Club "cruise in company" to the Channel Islands and France. Derek H kindly offered me a place on his Sadler 26 yacht. The table below links to GPS tracks and some photos from that trip. We left SYC on the Exe Estuary on Friday 27th May for Brixham (in Devon), then to St Peter Port on Guernsey, on to Dixcart Bay on Sark, on to to Treguier in France, back to St Peter Port and finally back to SYC on the Exe (4th June). Sail down to Brixham Friday 27th May 2016 A sail from Starcross down to Brixham ready for an early morning channel crossing to St Peter Port - Guernsey. 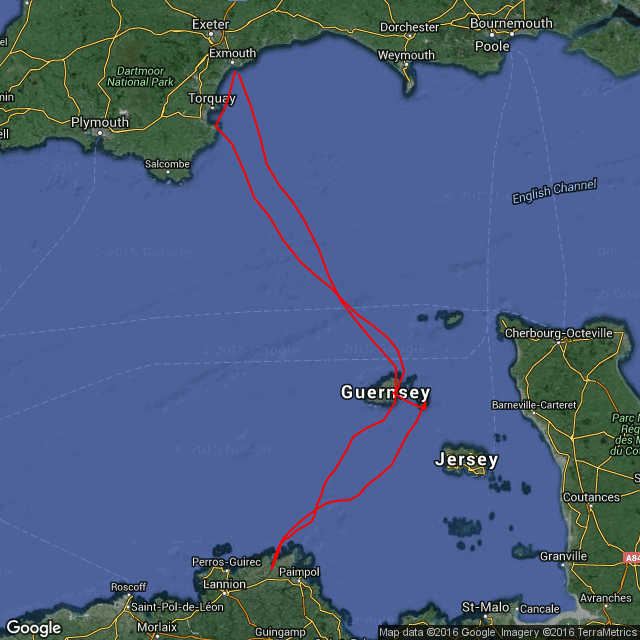 Brixham to Guernsey Saturday 28th May 2016 A sail across from Brixham Marina to St Peter Port in Guernsey. St Peter Port to Dixcart Bay Sunday 29th May 2016 A lovely sail across from St Peter Port on Guernsey to Dixcart Bay on Sark. Dixcart on Sark to Treguier, France Monday 30th May 2016 A downwind sail from the Dixcart Bay anchorage on Sark and up the Jaudy river to Treguier in France. Treguier to St Peter Port Thursday 2nd June 2016 From Treguier in France back to St Peter Port in Guernsey. St Peter Port back to the Exe Saturday 4th June 2016 From St Peter Port on Guernsey back to the moorings at Starcross Yacht Club on the Exe Estuary. Photos from time spent in Treguier are available here and here with photos from a visit to near Les Hanois on Guernsey available here.